Folks who pay attention to energy and climate issues are regularly treated to two competing depictions of society’s energy options. * On one hand, the fossil fuel industry claims that its products deliver unique economic benefits, and that giving up coal, oil, and natural gas in favor of renewable energy sources like solar and wind will entail sacrifice and suffering (this gives a flavor of their argument). Saving the climate may not be worth the trouble, they say, unless we can find affordable ways to capture and sequester carbon as we continue burning fossil fuels. On the other hand, at least some renewable energy proponents tell us there is plenty of wind and sun, the fuel is free, and the only thing standing between us and a climate-protected world of plentiful, sustainable, “green” energy, jobs, and economic growth is the political clout of the coal, oil, and gas industries (here is a taste of that line of thought). Which message is right? Will our energy future be fueled by fossils (with or without carbon capture technology), or powered by abundant, renewable wind and sunlight? Does the truth lie somewhere between these extremes—that is, does an “all of the above” energy future await us? Or is our energy destiny located in a Terra Incognita that neither fossil fuel promoters nor renewable energy advocates talk much about? As maddening as it may be, the latter conclusion may be the one best supported by the facts. Let’s start with the claim that giving up coal, oil, and gas will hurl us back to the Stone Age. It’s true that fossil fuels have offered extraordinary economic benefits. The cheap, concentrated, and portable energy stored in these remarkable substances opened the way, during the past couple of centuries, for industrial expansion on a scale previously inconceivable. Why not just continue burning fossil fuels, then? Over the long term that is simply not an option, for two decisive reasons. First, burning fossil fuels is changing the climate to such a degree, and at such a pace, that economic as well as ecological ruin may ensue within the lifetimes of today’s schoolchildren. The science is in: either we go cold turkey on our coal, oil, and gas addictions, or we risk raising the planet’s temperature to a level incompatible with the continued existence of civilization. Second, these are depleting, non-renewable sources of energy. We have harvested them using the low-hanging fruit principle, which means that further increments of extraction will entail rising costs (for example, the oil industry’s costs for exploration and production have recently been soaring at nearly 11 percent per year) as well as worsening environmental risks. This problem has been sneaking up on us over the last ten years, as sputtering conventional oil and natural gas production set the stage for the Great Recession and the expensive (and environmentally destructive) practices of “fracking” and tar sands mining. Despite the recent plunge in oil prices the fossil fuel party is indeed over. Sooner or later the stark reality of declining fossil energy availability will rivet everyone’s attention: we are overwhelmingly dependent on these fuels for nearly everything we eat, consume, use, and trade, and—as Americans started to learn in the 1970s as a result of a couple nasty oil shocks—the withdrawal symptoms are killer. So while fossil fuel promoters are right in saying that coal, oil, and gas are essential to our current economy, what they omit mentioning is actually more crucial if we care how our world will look more than a few years into the future. Well then, are the most enthusiastic of the solar and wind boosters correct in claiming that renewable energy sources are ready to substitute for coal, oil, and gas quickly enough and in sufficient quantity to keep the global economy growing? There’s a hitch here, which critics are only too quick to point out. We’ve designed our energy consumption patterns to take advantage of controllable inputs. Need more power? If you’re relying on coal for energy, just shovel more fuel into the boiler. But solar and wind are different: they are available on Nature’s terms, not ours. Sometimes the sun is shining or the wind is blowing, sometimes not. Energy geeks have a vocabulary to describe this—they say solar and wind power are intermittent, variable, stochastic, or chaotic. There are ways of buffering this variability: we can store energy from renewable sources with batteries or flywheels, or pump water uphill so as to recapture its potential energy later when it flows back downstream; or we can build a massive super-grid with robustly redundant generating capacity so that, when sun and wind aren’t available in one region, another region can cover demand throughout the entire interconnected system. But these strategies cost money and energy, and add layers of complexity and vulnerability to what is already the largest machine ever built (i.e., the power grid). Crucially, a recent study by Weissbach et al. compared the full-lifecycle energy economics of various types of power plants and found that once the intermittency of solar and wind energy is buffered by storage technologies, these sources become far less efficient than coal, natural gas, or nuclear plants; indeed, once storage is added, solar and wind fall “below the economical threshold” of long-term viability, regardless of the falling dollar price of panels and turbines themselves. The problem lies in the fact that the amount of energy embodied in the full generation-storage system cannot be repaid, with a substantial energy profit, by that system over its lifetime. Recent operational studies of solar PV systems in Spain and Australia have come to similar conclusions. Another way to deal with variability is demand management, which can take a variety of forms (I’ll be discussing some of those later in a fair amount of detail). These all, by definition, mean changing the ways we use energy. But for the moment let’s stay with the subject of energy supply. Early increments of solar and wind power are easy and cheap to integrate into the existing electricity distribution system because power from gas-fired peaking plants can quickly (literally, by the minute) be ramped up or down to accommodate these new, small, variable inputs while also matching changing overall demand levels. In this case, the price of wind and solar energy gets counted as just the immediate cost of building, installing, and maintaining turbines and panels. And, as the New York Times recently noted, the price of electricity from renewables (counted this way) is now often competitive with electricity from fossil fuels. On this basis, solar and wind are disruptive technologies: they’re getting cheaper while fossil fuels can only grow costlier. This one clear economic advantage of renewable energy—free “fuel” in the forms of sunlight and wind—is decisive, as Germany is now seeing with falling wholesale electricity prices (though retail prices are rising due to feed-in tariffs that require the utility industry to pay above-market prices for renewable electricity). Yet renewable energy technologies currently require fossil fuels for their construction and deployment, so in effect they are functioning as a parasite on the back of the older energy infrastructure. The question is, can they survive the death of their host? So far, we’ve talked only about electricity. The power generation sector arguably represents the easiest phase of the overall energy transition (since alternative technologies do exist, even if they’re problematic)—but only about 22 percent of global energy is consumed in the form of electrical power; in the US the figure is 33 percent. Our biggest single energy source is oil, which fuels nearly all transportation. Transport is central to trade, which in turn is the beating heart of the global market economy. Oil also fuels the agricultural sector, and eating is fairly important to most of us. Of the three main fossil fuels, oil is showing the most immediate signs of depletion, and renewable options for replacing it are fairly dismal. It is possible to electrify much of our transportation, and electric cars are now decorating showrooms. But they have a minuscule market share and, at the current growth rate, will take many decades to oust conventional gasoline-fueled automobiles (some analysts believe that growth rate will soon increase dramatically). In any case, batteries do not do well in large, heavy vehicles. 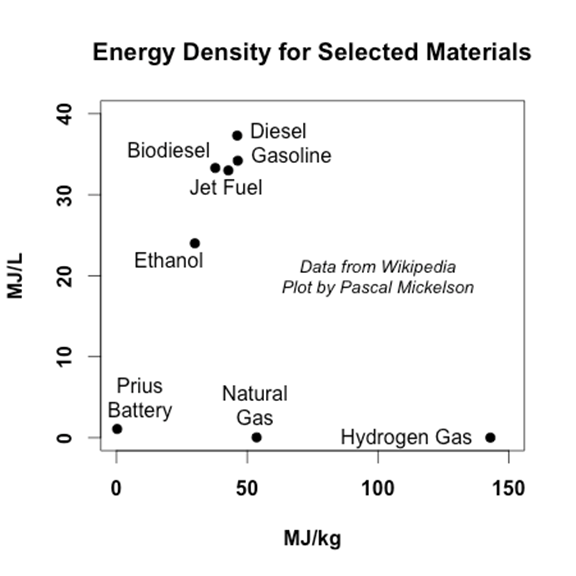 The reason has to do with energy density: an electric battery typically is able to store and deliver only about 0.1 to 0.5 megajoules of energy per kilogram; thus, compared to gasoline or diesel (at 44 to 48 MJ/kg), it is very heavy in relation to its energy output. Some breakthroughs in battery storage density and price appear to be on the horizon, but even with these improvements the problem remains: the theoretical maximum energy storage for batteries (about 5 MJ/kg) is still far below the energy density of oil. Neither long-haul trucking nor container shipping is ever likely to be electrified on any significant scale, and electric airliners are simply a non-starter. The promise of biofuels as a direct substitute for petroleum was widely touted a decade ago, but we hear much less on that score these days. It turns out that enormous subsidies are needed because the processes for producing these fuels are highly energy intensive. This goes for second-generation cellulosic ethanol and biodiesel from algae as well. Research into synthetic biology pathways to biofuel production remains in its infancy. Hydrogen offers a medium for storing energy in a way that can be used to power vehicles (among other things), and Toyota is about to release its first commercial hydrogen-powered car. But if we produce hydrogen with renewable energy, that means making H2 from water using solar or wind-based electricity; unfortunately, this is an expensive way to go about it (most commercially produced hydrogen is currently made from natural gas, because the gas-reforming process is inherently more efficient and therefore almost always cheaper than electrolysis, regardless of the electricity source). These problems lead some energy analysts to propose a cheaper alternative to oil: why not transition the transport fleet to burn compressed natural gas, which government and industry tell us is abundant and climate-friendly? Unfortunately this is no solution at all over the long term. Globally, natural gas may be available in quantity for several more decades, but optimistic forecasts of “100 years” of abundant US domestic gas supplies are proving to be unfounded, and methane leakage from production and transmission infrastructure may end up making gas even worse for the climate than oil. 3. How much energy will we have? The question is inescapable: will our renewable future offer less mobility? If so, this in itself would have enormous implications for the economy and for daily life. Another question arising from all of the above: will the quantity of energy available in our renewable-energy future match energy demand forecasts based on consumption trends in recent decades? There are too many variables to permit a remotely accurate estimate of how much less energy we might have to work with (we simply don’t know how quickly renewable energy technology will evolve, or how much capital investment will materialize). 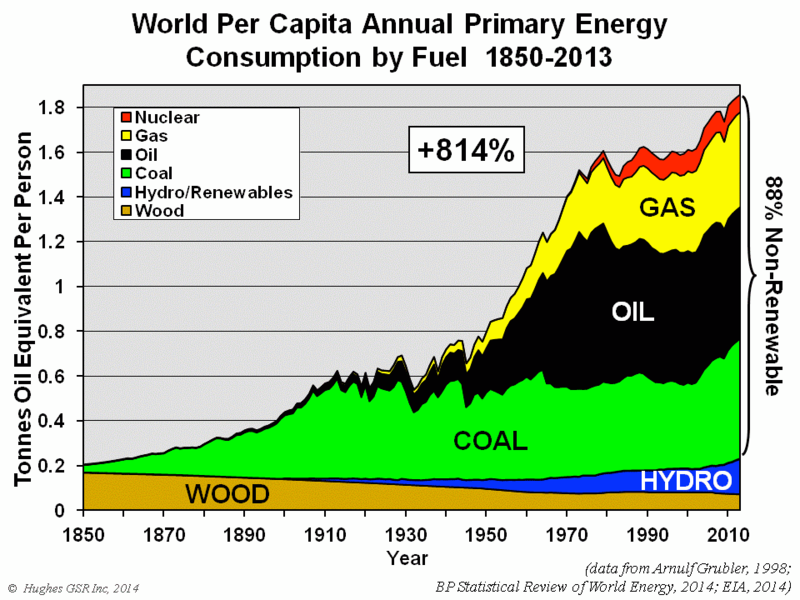 However, it’s good to keep in mind the fact that the energy transition of the 19th and 20th centuries was additive: we just kept piling new energy sources on top of existing ones (we started with firewood, then added coal, oil, hydropower, natural gas, and nuclear); further, it was driven by economic opportunity. In contrast, the energy transition of the 21st century will entail the replacement of our existing primary energy sources, and it may largely be driven either by government policy or by crisis (fuel scarcity, climate-induced weather disasters, or economic decline). Even supply forecasts from renewable energy optimists who tell us that intermittency is affordably solvable typically assume we will have less available electrical energy, once the shift away from fossil fuels is complete, than the International Energy Agency estimates that we would otherwise want (for example, analysis by Lund and Mathieson projects energy consumption levels in 2030 in Denmark to be only 11 percent higher than 2004 demand, with no further increase between 2030 and 2050, whereas IEA forecasts assume continued demand growth through mid-century). However, if (as the Weissbach study suggests) intermittency is in fact a serious economic burden for solar and wind power over the long term, then we need to entertain the likelihood that energy supplies available at the end of the century may be smaller—maybe considerably smaller—than they are now. At the same time, the qualities of our energy supply will differ from what we are used to. As explained earlier, solar and wind are intermittent, unlike fossil energy supplies. Further, while planet Earth is blessed with lots of wind and sunlight, these are diffuse energy sources that need collecting and concentrating if they’re to operate heavy machinery. During the coming energy transition, we will be shifting from energy sources with a small geographic footprint (e.g., a natural gas well) toward ones with larger footprints (wind and solar farms collecting ambient sources of energy). True, we can cut the effective footprint of solar by using existing rooftops, and wind turbines can share space with food crops. Nevertheless, there will be unavoidable costs, inefficiencies, and environmental impacts resulting from the increasing geographical extent of energy collection activities. The potency of fossil fuels derives from the fact that Nature did all the prior work of taking energy from sunlight, storing it in chemical bonds within plants, then gathering those ancient plants and transforming and concentrating their chemical energy, using enormous heat and pressure, over millions of years. Renewable energy technologies represent attempts to gather and concentrate ambient energy in present time, substituting built capital for Nature’s free gifts. Moreover, while electrical power is easily transported via the grid, this doesn’t change the fact that sunlight, hydropower, biomass, and wind are more available in some places than others. Long-distance electricity transmission entails infrastructure costs and energy losses, while transporting biomass more than a hundred miles or so typically erases the crucial energy profitability of its use. The price of renewable energy is falling while the cost of producing fossil fuels is rising. The crossover point, where fossil fuels cease to be cost competitive, could come soon—perhaps in the next decade. What happens then? As batteries get cheaper, electric cars could become the industry standard; reduced gasoline demand would likely force the price of oil below its marginal production cost. If falling demand periodically outpaced declining supply (and vice versa), the result would be increasingly volatile petroleum prices, which would be bad for everyone. Meanwhile as more businesses and homes installed cost-competitive solar-and-battery systems, conventional utilities could go bankrupt. The result: we would have green energy technology, but not the energy means to maintain and reproduce it over the long run (since every aspect of the renewable energy deployment process currently relies on fossil fuels —particularly oil— because of their unique energy density characteristics). During the transition, what proportion of the world’s people would be able to afford the up-front investment required for entry into the renewable energy club? It’s likely that many (including poor people in rich countries) would not, especially given current trends toward increasing economic inequality; for these folks, conventional fossil-based grid power would likewise become unaffordable, or simply unavailable. What if renewable energy optimists are right in saying that solar and wind are disruptive technologies against which fossil fuels cannot ultimately compete, but renewables critics are correct in arguing that solar and wind are inherently incapable of powering industrial societies as currently configured, absent a support infrastructure (mines, smelters, forges, ships, trucks, and so on) running on fossil fuels? The Google team defined “success” as identifying a renewable energy system that could compete economically with coal and could also be deployed fast enough to stave off the worst climate change impacts. The team concluded that renewable energy isn’t up to that job. In their article, Koningstein and Fork put on a brave face, hoping that some currently unknown energy source will appear at the last minute to save the day. But putting one’s faith in a currently non-existent energy source seems less realistic than working for dramatic improvements to solar and wind technologies. A completely new source would require decades for development, testing, and deployment. Realistically, our choice of replacements for fossil fuels is limited to energy sources that can be harnessed with current technology, even if they can’t keep the industrial growth engine humming. In inquiring whether renewable energy can solve the climate crisis at essentially no net economic cost, Koningstein and Fork may have been posing the wrong question. They were, in effect, asking whether renewables can support our current growth-based industrial economy while saving the environment. They might more profitably have inquired what kind of economy renewable energy can support. We humans got by on renewable sources of energy for millennia, achieving high levels of civilization and culture using wind, sun, water, wood, and animal power alone (though earlier civilizations often faced depletion dilemmas with regard to resources other than fossil fuels). The depletion/climate drawbacks of fossil fuels ensure that, as the century progresses, we will indeed return to a renewables-based economy of some sort, running on hydropower, solar, wind, and a suite of other, more marginal renewable sources including biomass, geothermal, wave, microhydro, and tidal power. We always adapt our energy sources, as much as we can, to suit the ways we want to use energy. It is therefore understandable that most people would like somehow to make solar and wind act just like fossil fuels, which have shaped our current consumption patterns. But that leads us back to the problems of energy storage, capacity redundancy, grid redesign, transport electrification, and so on. Weissbach’s study suggests that the costs of enabling solar and wind to act like fossil fuels are so great as to virtually cancel out these renewables’ very real benefits. Reluctantly but increasingly, we may have to adapt the ways we use energy to suit the quantities and inherent qualities of the energy available to us. Fossil fuels shaped our current infrastructure of mines, smelters, forges, factories, pipelines, grids, farms, highways, airports, pumps, shopping malls, suburbs, warehouses, furnaces, office buildings, houses, and more. We built the modern world with the assumption that we would always have more energy with similar characteristics to maintain, operate, and replace this staggering and still-growing array of machines, structures, and support systems. Where it is absolutely essential to maintain these systems in their current form, we will certainly make every effort to adapt our new energy sources to the job (using batteries, for example); where systems can themselves be adapted to using less energy or energy that is intermittently available, we will adapt those systems. But in many instances it may be unaffordable to adapt either the energy source or the usage system; in those cases, we will simply do without services we had become accustomed to. This may be the renewable future that awaits us. To prepare for that likelihood, we need to build large numbers of solar panels and wind turbines while also beginning a process of industrial-economic triage. Reconfiguring civilization to operate on less energy and on energy with different characteristics is a big job—one that, paradoxically, may itself require a substantial amount of energy. If the necessity of expending energy on a civilization rebuild coincides with a reduction in available energy, that would again mean that our renewable future will not be an extension of the expansive economic thrust of the 20th century. We may be headed into lean times. Granted, there is a lot of uncertainty here. Some countries are better placed to harvest ambient natural energy sources than others. Some academic studies paint an over-optimistic picture of renewables, because they focus only on electricity and ignore or understate the costs of variability mitigation; other studies arrive at unfairly pessimistic assessments of renewables because they use obsolete price data. It’s hard to portray our renewable future in a way that one analyst or another will not dispute, at least in terms of detail. Nevertheless, most energy experts would probably agree with the general outline of renewable energy’s potential that I’ve traced here. I consider myself a renewable energy advocate: after all, I work for an organization called Post Carbon Institute. I have no interest in discouraging the energy transition—quite the contrary. But I’ve concluded that many of us, like Koningstein and Fork, have been asking the wrong questions of renewables. We’ve been demanding that they continue to power a growth-based consumer economy that is inherently unsustainable for a variety of reasons (the most obvious one being that we live on a small planet with finite resources). The fact that renewables can’t do that shouldn't actually be surprising. What are the right questions? The first, already noted, is: What kind of society can up-to-date renewable energy sources power? The second, which is just as important: How do we go about becoming that sort of society? As we’ll see, once we begin to frame the picture this way, it turns out to be anything but bleak. Our degree of success in this all-encompassing transition will partly depend on our ability to master a couple of simple energy concepts. The first is energy returned on energy invested (EROI or EROEI). It takes energy to get energy: for example, energy is needed to drill an oil well or build a solar panel. The historic economic bonanza resulting from society’s use of fossil fuels partly ensued from the fact that, in the 20th century, only trivial amounts of energy were required for drilling or mining as compared to the gush of energy yielded. High EROEI ratios (in the range of 20:1 to 50:1 or more) for society’s energy-obtaining efforts meant that relatively little capital and labor were needed in order to supply all the energy that society could use. As a result, many people could be freed up from basic energy-producing activities (like farming), their labor being substituted by fuel-fed machines. Channeled into manufacturing and managerial jobs, these people found ways to use abundant, cheap energy to produce more goods and services. The middle class mushroomed, as did cities and suburbs. In the process, we discovered an unintended consequence of having an abundance of cheap “energy slaves” in the forms of tons of coal, barrels of oil, and cubic feet of natural gas: as manufacturing and other sectors of the economy became mechanized, many pre-industrial professions disappeared. The EROEI ratios for fossil fuels are declining because the best-quality resources are being used up; meanwhile, the energy return figures of most renewable energy sources are relatively low compared to fossil fuels in their heyday (and this is especially true when buffering technologies—such as storage equipment, redundant capacity, and grid expansions—are accounted for). Characteristics of energy resources (source: David Murphy). 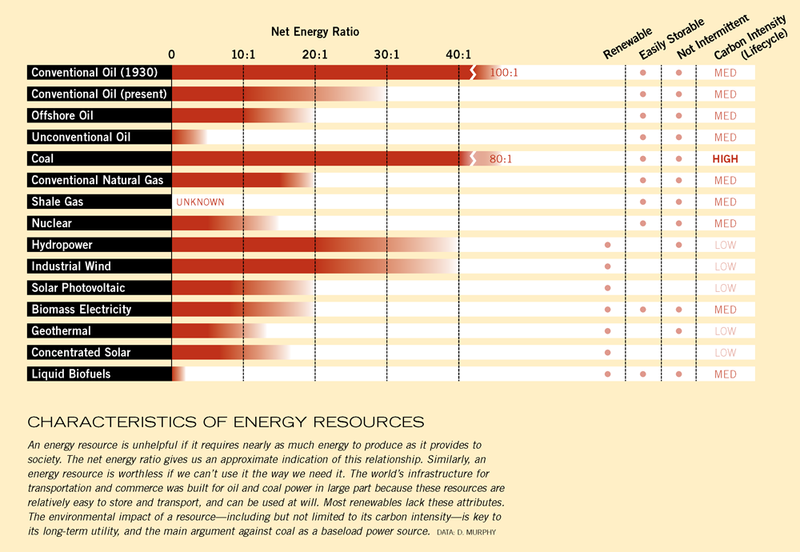 “Net Energy Ratio” in this chart is essentially the same as EROEI. The practical result of declining overall societal EROEI will be the need to devote proportionally more capital and labor to energy production processes. This is likely to translate, for example, to the requirement for more farm labor, and to fewer opportunities in professions not centered on directly productive activities: we’ll need more people making or growing things, and fewer people marketing, advertising, financing, regulating, and litigating them. For folks who think we have way too much marketing, advertising, financialization, regulation, and litigation in our current society, this may not seem like such a bad thing; prospects are likewise favorable for those who desire more control over their time, labor, and sources of sustenance (food and energy). A second essential energy concept has to do with the difference between embodied and operational energy. When we contemplate the energy required by an automobile, for example, we are likely to think only of the gasoline in its tank. However, a substantial amount of energy was expended in the car’s construction, in the mining of ores from which its metal components were made, in the making of the mining equipment, and so on. Further, enormous amounts of energy were spent in building the infrastructure that enables us to use the car—the systems of roads and highways, the networks of service stations, refineries, pipelines, and oil wells. The car’s gasoline supplies operational energy, but much more energy is embodied in the car itself and its support systems. This latter energy expenditure is easily overlooked. The energy glut of the 20th century enabled us to embody energy in a mind-numbing array of buildings, infrastructure, machines, gadgets, and packaging. Middle-class families got used to buying and discarding enormous quantities of manufactured goods representing generous portions of previously expended energy. If we have less energy available to us in our renewable future, this will impact more than the operation of our machines and the lighting and heating of our buildings. It will also translate to a shrinking flow of manufactured goods that embody past energy expenditure, and a reduced ability to construct high energy-input structures. We might find we need to purchase fewer items of clothing and furniture, and fewer electronic devices, and inhabit smaller spaces. We might also use old goods longer, and re-use and re-purpose whatever can be repaired. We might need to get used to buying more basic foods again, rather than highly processed and excessively packaged food products. Exactly how far these trends might proceed is impossible to say: we are almost surely headed toward a simpler society, but no one knows ultimately how simple. Nevertheless, it’s fair to assume that this overall shift would constitute the end of consumerism (i.e., our current economic model that depends on ever-increasing consumption of consumer goods and services). Here again, there are more than a few people who believe that advanced industrial nations consume excessively, and that some simplification of rich- and middle-class lifestyles would be a good thing. Food: Fossil fuels are currently used at every stage of growing, transporting, processing, packaging, preparing, and storing food. As those inputs are removed from food systems, it will be necessary to bring growers and consumers closer together, and to replace petrochemical-based fertilizers, herbicides, and pesticides with agro-ecological farming methods that rely on crop rotation, intercropping, companion planting, mulching, composting, beneficial insects, and promotion of microbial activity in soils. As mentioned earlier, we will need many more farmers, especially ones with extensive practical, local ecological knowledge. Water: Enormous amounts of energy are used in extracting, moving, and treating water; conversely, water is used in most energy production processes. We face converging water crises arising from aging infrastructure and climate change-related droughts and floods. All this suggests we must become far more water thrifty, find ways to reduce the energy used in water management, use intermittent energy sources for pumping water, and use water reservoirs for storing energy. Resource extraction (mining, forestry, fishing): Currently, extractive industries rely almost entirely on petroleum-based fuels. Since, as we have seen, there are no good and comprehensive substitutes for these fuels, we will have to reduce resource extraction rates, reuse and recycle materials wherever possible, and employ more muscle power where possible in those extractive processes that must continue (such as forestry). Building construction: Cement, iron, and road-building materials embody substantial amounts of energy, while large construction equipment (cranes, booms, bulldozers) requires concentrated energy for its operation. We must shift to using natural, locally available building materials, and more labor-intensive construction methods, while dramatically reducing the rate of new construction. The amount of enclosed space per person (home, work, shopping) will shrink. Building operations: We’ve gotten used to actively heating, cooling, ventilating, and lighting our buildings with cheap, on-demand energy. We will need to maximize our passive capture of ambient, variable, solar energy using south-facing glazing, superinsulation, and thermal mass. Whatever active energy use is still required will employ efficient heat pumps and low-energy LED lighting, powered mostly by solar cells and wind turbines with minimal storage and redundancy (so as to maximize EROEI). Manufacturing: Our current system is globalized (relying on oil-based transport systems); consumes natural gas, electricity, and oil in manufacturing processes; and uses materials that embody large amounts of energy and that are often made from fossil fuels (i.e., plastics). Lots of energy is used also in dealing with substantial flows of waste in the forms of packaging and discarded products. The economy has been fine-tuned to maximize consumption. We must shift to shortened supply chains, more localized manufacture of goods (shipping information, not products), materials with low embodied energy, and minimal packaging, while increasing our products’ reuse and repair potential. This will be, in effect, an economy fine-tuned to minimize consumption. Health care: The high dollar cost of modern health care is a rough indication of its energy intensity. As the energy transition gains momentum, it will be necessary to identify low-energy sanitation and care options, and prioritize prevention and local disaster response preparedness. Eventually, high-energy diagnostics and extreme end-of-life interventions may simply become unaffordable. Treatment of chronic conditions may rely increasingly on herbs and other traditional therapies (in instances where their efficacy can be verified) as the pharmaceutical industry gradually loses its capability to mobilize billions of dollars to develop new, targeted drugs. Transportation: The energy transition will require us to prioritize transport modes according to operational and embodied energy efficiency: whereas automobile and truck traffic have been richly subsidized through road building in the last seven decades, governments should instead devote funds toward electrified rail networks for both freight and passenger travel. We must also design economic and urban systems so as to reduce the need for motorized transportation—for example, by planning communities so that most essential services are within walking distance. Finance: It would appear that comparatively little energy is needed to run financial systems, as a few taps on a computer keyboard can create millions of dollars instantly and move them around the globe. Nevertheless, the energy transition has enormous implications for finance: heightened debt levels imply an increased ability to consume now with the requirement to pay later. In effect, a high-finance society stimulates consumption, whereas we need to reduce consumption. Transition strategies should therefore include goals such as the cancelation of much existing debt and reduction of the size and role of the financial system. Increasingly, we must direct investment capital toward projects that will tangibly benefit communities, rather than leaving capital investment primarily in the hands of profit-seeking individuals and corporations. You may have noticed that suggestions in each of these categories are far from new. Organized efforts to reduce both operational and embodied energy consumption throughout society started in the 1970s, at the time of the first oil price shocks. Today there are many NGOs and university programs devoted to research on energy efficiency, and to life cycle analysis (which seeks to identify and quantify energy consumption and environmental impacts of products and industrial processes, from “cradle to grave”). Industrial ecology, biomimicry, “cradle-to-cradle” manufacturing, local food, voluntary simplicity, permaculture, and green building are just a few of the strategies have emerged in the last few decades to guide us toward a more energy-thrifty future. Most major cities now have bicycle advocacy groups, farmers markets, and energy efficiency programs. These all represent steps in the right direction. Yet what is being done so far barely scratches the surface of what’s needed. There could be only one meaningful indication of success in all these efforts, and that would be a decline in society’s overall energy use. So far, we have seen energy declines primarily in times of severe economic recession—hardly ever purely as a result efficiency programs. What we need is not just to trim energy use here and there so as to save money, but to reconfigure entire systems to dramatically slash consumption while making much of the remaining energy consumption amenable to intermittent inputs. Another insight that comes from scanning energy reduction strategies in various societal sectors is that efforts already underway along these lines often have side benefits. There are tangible psychological, social, and cultural payoffs associated with local food and voluntary simplicity programs, and health improvements can follow from natural, energy-efficient dwellings, walking, bicycling, and gardening. A successful energy transition will require that we find ways to maximize and celebrate these benefits, while honestly acknowledging the full human and environmental costs of our decades-long, fossil-fueled joyride. In the march toward our energy future, the PR war between the fossil fuel industry and renewables advocates gets much of the attention. But it will be our effectiveness in the hard work of dramatically reducing and reconfiguring energy consumption—sector by sector, farm by farm, building by building, household by household, community by community—that will largely determine our overall success in what is likely to be history’s most difficult and crucially important economic shift. This is all politically charged. Some renewable energy advocates (particularly in the US) soft-pedal the “use less” message because we still inhabit an economy in which jobs and profits depend on stoking consumption, not cutting it. “Less” also implies “fewer”: if the amount of energy available contracts but human population continues growing, that will translate to an even sharper per capita hit. This suggests we need to start reducing population, and doing so quickly—but economists hate population decline because it compromises GDP and results in smaller generational cohorts of young workers supporting larger cohorts of retirees. Here is yet another message that just doesn’t sell. A contraction of energy, population, and the economy has only two things going for it: necessity and inevitability. From a political standpoint, some solar and wind advocates apparently believe it makes good strategic sense to claim that a renewable future will deliver comfort, convenience, jobs, and growth—an extension of the oil-fueled 20th century, but now energized by wind and solar electrons. Regardless of whether it’s true, it is a message that appeals to a broad swath of the public. Yet most serious renewable energy scientists and analysts acknowledge that the energy transition will require changes throughout society. This latter attitude is especially prevalent in Europe, which now has practical experience integrating larger percentages of solar and wind power into electricity markets. Here in the US, though, it is common to find passionate but poorly informed climate activists who loudly proclaim that the transition can be easily and fully accomplished at no net cost. Again, this may be an effective message for rallying troops, but it ends up denying oxygen to energy conservation efforts, which are just as important. I have good friends in the renewable energy industry who say that emphasizing the intermittency challenges of solar and wind amounts to giving more ammunition to the fossil fuel lobby. Barry Goldwater famously proclaimed that “Extremism in the defense of liberty is no vice”; in a similar spirit, some solar and wind boosters might say that a little exaggeration of renewable energy’s potential, uttered in defense of the Earth, is no sin. After all, fossil fuel interests are not bound by the need for strict veracity: they continually make absurd claims that the world has centuries’ worth of coal and gas, and decades of oil. It’s not a fair or equal fight: the size and resources of the fossil fuel industry vastly outweigh those of the renewables camp. And there could hardly be more at stake: this is war for the survival of our current civilization-supporting climate regime. Nevertheless, we will ultimately have to deal with the reality of what solar and wind can actually provide, and we will do so far more successfully if we plan and prepare ahead of time. There are a lot of smart, dedicated people working hard to solve the problems with renewables—that is, to make it cheaper and easier for these energy sources to mimic the 24/7 reliability of fossil fuels through improvements in energy storage and related technologies. None of what I have said in this essay is meant to discourage them from that important work. The more progress they make, the better for all of us. But they’ll have more chance of success in the long run if society starts investing significant effort into adapting its energy usage to lower consumption levels, more variable sources, and more localized, distributed inputs. The problem is, the gap between our current way of life and one that can be sustained with future energy supplies is likely to be significant. If energy declines, so will economic activity, and that will create severe political and geopolitical strains; arguably some of those are already becoming apparent. We may be headed into a crucial bottleneck; if so, our decisions now will have enormous repercussions. We therefore need an honest view of the constraints and opportunities ahead. At this point I must address a few words to “collapsitarians” or “doomers,” who say that only utter ruin, perhaps extinction, awaits us, and that renewables won’t work at all. They may be correct in thinking that the trajectory of society this century will be comparable to the collapse of historic civilizations. However, even if that is the case, there is still a wide range of possible futures. The prospects for humanity, and the fates of many other species, hang on our actions. What’s needed now is neither fatalism nor utopianism, but a suite of practical pathways for families and communities that lead to a real and sustainable renewable future—parachutes that will get us from a 17,000-watt society to a 2,000-watt society. We need public messages that emphasize the personal and community benefits of energy conservation, and visions of an attractive future where human needs are met with a fraction of the operational and embodied energy that industrial nations currently use. We need detailed transition plans for each major sector of the economy. We need inspiring examples, engaging stories, and opportunities for learning in depth. The transition to our real renewable future deserves a prominent, persistent place at the center of public conversation. The Transition Network, The Arthur Morgan Institute for Community Solutions, The Simplicity Institute, and many other organizations have already begun pioneering this work, and deserve support and attention. However, more framing and analysis of the issues, along the lines of this essay but in much greater depth, could also help. My organization, Post Carbon Institute, is embarking on a collaborative project to provide this. If you don’t hear much from me for a while, it’s because I’m working on it. Stay tuned. *For the sake of simplicity, I have omitted discussion of nuclear power from this essay. There are those who say that nuclear power will, or should, play a prominent role in our energy future. I disagree with this view. Globally, nuclear power—unlike solar and wind—is contracting, not growing (China provides one of only a few exceptions to this observation). Nations are turning away from nuclear power due to the high levels of required investment—which, in virtually every case, must be underwritten by government. They are doing so also because of the high perceived risk of accidents—especially since the commencement of the ongoing catastrophe at the Fukushima nuclear facility in Japan. Nuclear boosters advocate new fuels (thorium) or technologies (fast breeder reactors) to address these concerns. But many years of trials will be needed before these alternatives are ready to be deployed at scale; and it is unclear, even then, whether they will live up to claims and expectations. Richard Heinberg is a senior fellow at the Post Carbon Institute and the author of eleven books, most recently Snake Oil: How Fracking's False Promise of Plenty Imperils Our Future. Previous books include The Party's Over: Oil, War, and the Fate of Industrial Societies, Peak Everything: Waking Up to the Century of Declines, and The End of Growth: Adapting to Our New Economic Reality.